Iran after February 11 protest ,Fire Burning Under Ashes ! The green movement is alive and strong. This was the title of an article. The citys are full of silent majority opposition and regime does not know what to do and whom to arrest and can't arrest all .It has also become harder for the regime to identify and arrest people. Regime suspect anyone and arrest and this causes more problems for the regime. Thousands of people are arrested and detained in the last 9 months of protest.for the fear of another mass protest ,regime has approached and built more into oppressive machines. spends more money to build its riot police, militias and intelligence forces and propaganda machine.According to a report , regime is trying to hire more human forces into its militias. Regime so far has executed four people or more and 20 other are awaiting to be executed, this is to create more fear among oppositions.It has oppened criminal file for more than 100 women activists who call for their human rights.It has more than 63 journalist and photojournalists in prison and almost the same number of journalists have left Iran to escape arrest and detention. despite of all the threats by high ranking and Khamenei the leader of the Islamic Republic, Karubi and Musavi are not bending and continue to emphasize on the cheating in the presidential election and not recognizing the government of Ahmadinejad. The "Seda va Sima " the propaganda machine of the hardliner conservative in the recent show attacked on liberal democracy and refome and called libera opposition as facists. The hard liners call the reformists as "Sarane Fetneh" or "the heads of sedition" . In the picture above which has been taken recently, "these seditious" personalities have gathere in the Khomein's office , they are : Khatami, Karubi, Seyed Hassan khomeini ( the grand sone of Khomeini-the Islamic Republic founder)including Rafsanjani. Regime is affraid of liberal thoughts growing among people. despite of showing its teeth , i believe firmly that regime is affraid for yet another mass protest , indeed regime is really affraid. A group of Basiji students&militia questioned Faezeh Hashemi (daughter of Rafsanjani)- Q:until when you are going to continue the green movement? The Iranian government should immediately stop harassing and arbitrarily detaining members of the Baha’i community, Human Rights Watch said today.The detention of 13 Baha’is on February 10 and 11 follows the arrest of 13 others in early January. The government alleges that those arrested in January helped to organize recent anti-government demonstrations but has not made public any charges against those detained in February. These arrests come during a broad government crackdown on opposition activists.“The Iranian government seems to be using the post-election unrest as a cover for targeting the Baha’i community,” said Joe Stork, deputy Middle East and North Africa director at Human Rights Watch. “These arrests are only the latest chapter in the government’s systematic persecution of the Baha’i.”Unlike Iran’s Jewish, Christian, and Zoroastrian communities, which are accorded constitutional protection, the Iranian government does not recognize the Baha’i Faith and considers its adherents to be apostates from Shi’a Islam. Since the Islamic revolution in 1979, the Iranian government has put in effect various discriminatory policies against the Baha’is, including limiting access to education and employment.Since October 2009, authorities have detained at least 47 Baha’is in Tehran, Mashhad, Sari, Semnan, and Yazd, according to the United Nations office of the Baha’i International Community (BIC) in Geneva. In May 2008, the government arrested seven leaders of the Baha’i community in Tehran, who have been held in detention since then. Their trial began on January 12, but has been postponed to April 10. Help release Iranian journalists from the Islamic Republic dungeon! 1-Badrolsadat Mofidi - She is the secretary of the Association of Journalists in Iran.She was arrested together with her husband Mr. Masoud aghaei in their home just after the holy days of Ashura and were transfered to Ward number 209 in Evin prison.She sufferes from blood disorder and the prison officials prevent her to receive medication. 2-Mohammad Nourbakhsh-the editor of "Farhikhtegan" newspaper . he has been in Evin prison for more than seven months.there are not enough news about him. 3-Ahmad jalaei Farahani- Editor of the social desk in "Mehr" news agency .One day after layoff from newspaper on Feb.6, he was arrested by some people who identified themselves as security forces of the judiciary power.He is believed to be in Evin prison and according to his parents , his young daughter is sobbing and looking for father. 4-Keivan Samimi - Manager in charge of the banned "Nameh " publication and member of the central council of "Association Defending Freedom of Press" . He was arrested on June 16 ,2009. For a a leave of prison to attened in his daughters wedding the court asked for 100 million Tuman (Almost $100000). He has been sentenced to 6 years imprisonment and banned from social activities for life. 5-Bahman Ahmadi-Amouei- Journalist of reformist newspapers.He worked as economic correspondent.he was arrested on the evening of June 20 together with his wife Jila Bani-Yaghoub.court didn't agree to release him on bail.He was sentenced to 7 years and four months imprisonment and 34 lashes. 6-Hassan Zahouri- journalist, senior reporter on cultural herritage. he was arrested at his home on Feb.7. 7-Sasan Aghaei- journalist , he was arrested on Nov. 22 after the release of an open letter by 293 journalists to religious leaders. His case is still open and no decision is made on his case file yet. 8-Said Leilaz - Former editor in chief of "Sarmayeh" newspaper. He has been in prison for the past eight months.He is economic critics. He has been kept in security ward in Evin prison. 9-Maziar samiei- Journalist , he was arrested in the mid night of Feb.3 by ther security forces and there are no news about his whereabout.Since his arrest, he was able to make a call to his parents only once and since Feb. 5 there is no news about him. 10-Ali Hekmat -Editor in chief of reformist "Khordad" newspaper .He has been in prison for more than four months.He was able to talk to his parents for the first time after 98 days. 11-Masoud Bastani-On the morning of June 25 left his home to attend Tehran court of revolution to follow the situation of his wife Mahsa Amrabadi who was detained and he himself was arrested too. after three and a half months time prison , he was sentenced to six years imprisonment.This journalist was transfered to "Rejaei Shahr' prison which is one of the worst prison . 12-Emadodin Baghi -Journalist and human rights advocate. He is the founder of the "committee defending the rights of prisoners". He was arrested on Dec. 28 and in a contact with his family he said : he is arrested in connection with the interview he made with Ayatollah Montazeri. 13- Wahid pourostad_ Journalist of "Farhikhtegan" newspaper .He was arrested on Feb. 8 at 2:30 in the morning in his mother inlaw's home.His name is not in the lists of journalist arrested and this made his family to worry more. 14-Reza Tajik- Journalist and activist , he was arrested on Dec. 29 in front of "Etemad" newspaper.He was also arrested once after the presidential election in June and spent 46 days in prison. 15-Behrang Tonekaboni & Leili Farhadpour - Editor in chief of music magazine known as " Farhang O Ahang" .He is the son of journalist Leili Farhadpour.He was arrested at his workplace on Jan. 5 . While his mom Leili Farhadpour was following his case, had heart attack and was admitted in hospital , but after release from hospital , she was arrested at her home by the agents of Ministry of information. 16-Niloufar Laripour- Poet , song writer and reporter of "Chelcheragh" publication. Was arrested on Feb. 2nd. 17- Roozbeh Karimi- journalist and student of higher education on Human rights.He was arrested together with his wife Forough Mirezaei on Jan. 2nd. at his home. 18-Zeynab Kazemkhah - Journalist of a government media . She was arrested on Feb. 7 at her home by 9 agents from the Ministry of Information . 19-Noushin Jafari- The 22 years old journalist and writer of "Art & Literary" in Etemad newspaper.she was arrested on Feb. 4 at her home. 20-Mohammad Davari- editor in chief of "Saham " news ( Official website of Etemad newspaper ).was arrested on Sep. 8. Regime requested a 200 million Tuman bail for his release , but he was unable to pay.for the last 5 months he has been in prison. He is the one who prepared video report from those prisoners who were sexually raped. 21-Said Matinpour-An Azarbayejan journalist who suffers from heat problems.He is currently in Evin prison and was sentenced to 8 years in prison. 22-Said Masoud Lavasani - journalist and blogger and he was arrested four months ago from his home.He was sentenced to eight and a half years prison term and is banned to see his two years old son. 23-Ahmad Zeidabadi-journalist and political analyst , he was arrested on June 13.he was sentenced to 5 years prison term and exile to the remote area of "Gonabad". he was transfered from evin prison to the "Rejaei Shahr" prison. 24-Eisa Saharkheiz- A journalist and one of the founder of association Defending Freedom of Press.A well known journalist and political personality.he was arrested on July 2nd. 25-Mashaollah shamsolvaezin- Journalist and spokesperson of the Association of Journalists in Iran . He was arrested on Dec. 29 at his home without a warrant. 26-Amir Sadeghi-A photojournalist who was arrested in "Farhange Ashti "newspaper's office .he was arrested on Feb. 7 and charged with publishing pictures from protest of the Holy Days of Ashura. 27-Fouad Sadeghi - Founder of "Baztab and Ayandeh news " website. he was arrested on Feb. 10 by security agents. 28-Ehsan Mehrabi- Parliamentary reporter of "Farhikhtegan' newspaper.He was arrested on Feb. 11 . His family are worried on his whereabout. 29-Akbar montajebi- journalist of Sharq, Hammihan, Hamshahri newspaper and Shahrvandemrouz magazine. he was arrested after Feb. 11 and there is no news about him. 30-Hamzeh Karami-He is in Evin prison from the past 8 months. He has been sentenced to 16 years prison term and 6 billion Tuman cash money. Karami is in a very bad shape after hearing this sentencing. 31-Alireza firouzi-young blogger and journalist from Tabriz ,since Jan. 2nd he was kidnapped by security agents.No one knows about his whereabout. Translated by IRAN WATCH CANADA - Be loyal to IRAN WATCH CANADA when using this translation. Is borned in Tehran on 1963. After finishing his elementary and high school in " Hefdah Shahrivar " or (17 september) district in Tehran , he joined theological school in the city of Qom and Mashhad. He had his theological studies under Sheikh Javad Tabrizi , Fazel Lankarani and seyed Ali Khamenei. On 1982 he become member of "Sepah Pasdaran Enghelabe Islami " or Revolutionary Guard of the Islamic Revolution.He had started his activities from the revolutionary guard of the 10th district in Tehran.He had different duties in the revolutionary guards of the city of Qom and Mashhad. He was for a while deputy coordinator in the office of Seyed Ali Khamenei the leader of the Islamic Republic.He also served for three years as cultural deputy in the " joint staff headquarter of the revolutionary guards".He was the commander of the cultural college of " Imam Hosein " University. On July 2008 he resigned as successor to the commander of "Basij Resistance forces " and become the commander of Basij Resistance forces.It has been widely reported that he had important role and influence in the arrest ,torture ,forced confession and killings of the protester's after the June 12, 2009 presidential election events in Iran.Taeb is now 46 years old.He is beleived to be a secret member of "Hojatieh" ( a group believe the appearance of 12th Imam, when the situation of Iran is at its worse condition). Recently with regard to Ahmadinejad, he told to "Kalameh" website that:Ahmadinejad is a good person, a principle follower and in this situation ,he is the best of its kind. He also said : Ahmadinejad is preparing the situation for the coming or appearance of the 12th Imam. 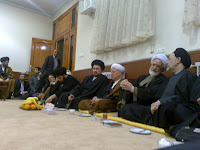 Currently Taeb is a professor of theology in "Elmieh School of Theology" in the city of Qom. Hosein Taeb is also a well documented suspect in the "Kahrizak" prison for murdering innocent young Iranian protesters. Prominent lawyer,human rights defender and vice president of FIDH Abdolkarim Lahiji speaking with Iranian gathered in front of UN in Geneva! 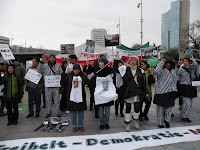 On Feb.15,16and 17 Iranian human rights advocate from around Europe and North America gathered in front of UN in Geneva and protested massive violation of Human Rights in Iran by the regime of coup d'etat. Mr. Abdolkarim Lahiji , lawyer and prominent Iranian Human Rights defender and vice president of FIDH (International Federation of Human Rights ) spoke for the gathering. A coalition of IFEX members launched a campaign last week on the 31st anniversary of the Iranian revolution, to pressure the government of Iran to release journalists and activists imprisoned for exercising their right to free expression. The "Our Society Will Be a Free Society" campaign is named for a pledge that Ayatollah Khomenei made during the 1979 Iranian Revolution to protect freedom of expression and the press. Bahman Ahmadi Amoyee, an Iranian journalist who was imprisoned following last year’s post-election protests, is about to be sentenced to flogging and prison. Amoyee, whose wife, Jila Baniyaghoob, won an IWMF Courage in Journalism Award in 2009, is an editor at the business daily newspaper Sarmayeh, which was closed by Iranian authorities in November. On February 19, he is appealing his January sentence of seven years and four months’ imprisonment and 32 lashes. Charges against him include "colluding with intent to harm national security,” "propaganda against the system" and "insulting the president." The IWMF is urging authorities to release him immediately and unconditionally. What Press Freedom means to you? The regime of coup d'etat and the green movement ! what now? Iran Watch Canad always tried to be loyal to the people of Iran. Iran Watch Canada is following just that principle and taking the interest of the people seriousely.May be here and there Iran Watch Canada expreses its opinion but the most important task of Iran Watch Canada is to monitor the human rights situation in Iran as much as it can cover with limited amount of resources. A- Mr. Karubi's son Ali Karubi was arrested in Feb. 11 and was detained and tortured. When he was released, he was admited in a hospital and this picture shows how badly he was beaten by the regime security forces. Despite of this and other evidence , Tehran prosecutor Mr. Dolatabadi told reporter that ; The son of Karubi wasn't arrested or detained. Well , he is the prosecutor of a president who is the "mother of all liers" . I dont expect he ,like his boss will say the truth. but , because of his position as prosecutor , he is responsible of his actions. B-The green movement has chosen few other dates for action in the future- one is the March 8 , the international women's Day and the other which is to be decided is the " Chahar Shanbeh souri" festivity ( The last Wednesday of the year - Persian celebrate this day by making small fires and jumping on it). C- Discussions on future green movement protest is the topic of dialouge among the green movement leaders and participants all over Iran and abroad. D- Major economic set back is reported all over the media's inside Iran. Fight among regime appointed officials is sharpening and people are worried what will happen next. According to some reporters in the coming Persian New Year, the economic situation will deteriorate. The price of basic commodities will increase and the inflation will reach to more than 40%.There are talks that the hydro electric may bankrupt and 900,000 employees and related businesses may end up losing their income.The pages of the newspapers are full of stories signaling for the worst economic situation ever the Islamic Republic faced after the Iran- Iraq war. E- The regime of Ahmadinejad is more in trouble abroad and the Iranian abroad are puting more pressure on regim's diplomats and diplomatic centre's. 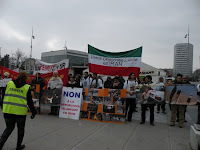 A session is going on in UN Geneva about the human rights violation in Iran and the opposition organized a campaign in front of UN headquarter. Regime is isolated. F- Regime has organized cyber attack on opposition websites but these website despite of the attack continue to fight back and expose the regime propaganda machine. The Iran social movement ( the green movement ) is welcoming more protesters for a social -political change in a new massive movement in Iran. This movement is all about evolution, the rights revolution , against violence and a civil rights movement. This movement while rising is lifting the spirit of people , the cultural understanding of the modern concept of life and politics and the Iranian deserve that lifestyle. People in a peaceful manner continue to demand the regime of coup d'etat to resign and a referendum to take place. 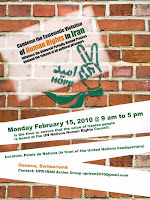 The United Nations Human Rights Council is to review the situation in the Islamic Republic of Iran on 15 February 2010. Until now, Iran has escaped any kind of sanction since the Council's creation in March 2006. A firm decision by the international community, including China and the countries of the Islamic Conference, would help to induce Iran to respect its human rights undertakings. When Iran was the first country to be reviewed by the Council in March 2007, the debate took place behind closed doors and the files were quickly classified after much bargaining among the various countries present. By using ideological and regionalist arguments with its "neighbours and friends," Iran finally emerged unscathed. Since President Mahmoud Ahmadinejad's disputed reelection on 12 June 2009, 29 newspapers have been closed, more than 130 journalists have been arrested and more than 60 have been forced to leave the country. This is unprecedented since the Islamic Republic of Iran's creation. Iran is now the world's biggest prison for the media with more than 80 journalists and netizens currently detained (48 journalists, 2 media assistants 18 netizens, 7 other arrests announced by the intelligence ministry and 8 under investigation). "The countries that say nothing about the bloody crackdown that has been taking place in Iran for the past eight months are accomplices to these crimes," Reporters Without Borders said. "When the UN Human Rights Council conducts its Universal Periodic Review of Iran, it must show that it is up to the task. Its credibility must not be eroded yet again." The press freedom organisation added: "The Council must demand the release of all the political prisoners, including the journalists, and must ensure that the Iranian government respects the right to freedom of expression in practice." Since 2000, several UN special rapporteurs have formulated criticisms and recommendations regarding respect for human rights in Iran. Following a visit to Iran from 15 to 27 February 2004, Louis Joinet, the head of the working group on arbitrary detention, published a damning report on the deterioration in the situation of human rights, including freedom of expression. He noted that solitary confinement for very long periods was widely used in Iran's prisons and could be regarded as a "prison within prison," one that lent itself to grave abuses. No action was even taken on Joinet's recommendations. 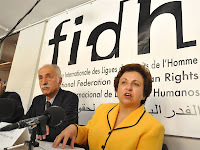 Ambeyi Ligabo, the special rapporteur on the promotion and protection of the right to freedom of opinion and expression, urged Iran in January 2004 to bring its judicial procedures into line with international standards and to adopt a human rights charter. In particular, he said revolutionary courts should no longer try crimes of opinion and he called for the abolition of prison sentences for crimes of opinion and press offences. The Islamic Republic has just been celebrating its 31st anniversary but its press freedom record during the past 31 years has been appalling. Several thousand newspapers have been closed since February 1979, hundreds of journalists have been arrested, hundreds have been sentenced to long jail terms and dozens have been summarily executed or murdered. Since June 2009, the crackdown on criticism of the regime's political and religious institutions has created a climate of terror leading to self-censorship and the flight of many journalists into exile. When journalists are arrested, their most fundamental rights are flouted and they are often subjected to long spells of being held incommunicado or in solitary confinement. These periods of being held incommunicado can be regarded as forced disappearances and crimes against humanity and constitute violations of international law. "The international community must now turn its words into actions," Reporters Without Borders said, calling for the Iranian government to be censured for its serious human rights violations and calling for UN special rapporteurs to be sent to Iran as matter of urgency. Mansur Osanloo one of the leader of Bus Transit Syndicate Workers Union and a political prisoner was transfered to a solitary confinement . To: Human Rights Council of the United NationsIn the 7th session of the United Nations’ rotational review of human rights on 15th to 17th of February 2010 in its headquarters in Geneva, the human rights situation in Iran is being reviewed. The beginning of this session coincides with the 4th anniversary of international solidarity with the imprisoned workers of the Iranian Transit Company. On 15 February 2006, many international workers and members of trade unions expressed their support of those detained workers and raised their protesting voices against the anti-union activities in Iran, to the authorities of the Islamic Republic of Iran (IRI). During all the years after the workers and union activists were detained, the IRI authorities have said that the imprisoned workers would be released if they sign undertakings not to be involved in union activities. The security forces have declared that despite the fact that IRI was a signatory to international treaties, it was not to its national interests to permit formation of workers’ unions and syndicates, and anyone attempting to do just that would be considered an enemy of the IRI and would be charged as such. In the passed 30 years, despite the main demands of the 1979 revolution, the financial conditions of working class in Iran not only has not improved, poverty and destitute aspects and lack of income has become rampant amongst them. The situation is so bad that the International Labour Organization (ILO) has categorized Iran among the worst 3 countries in the world in terms of working conditions and the most basic rights of workers being denied. The working situation of youth and women has reached catastrophic proportions. Lack of work place safety, temporary monthly contracts, and blank contracts have become routine practice in hiring workers. The minimum wages in Iran is four times less than the poverty line. Families of millions of workers are constantly desperate to earn daily sustenance because of delayed payments for their labors and the huge numbers of the unemployed and the ones in danger of becoming employed workers has created hell on earth for them and their families and dependents. To them, the only way out of such inhuman conditions is to make drastic changes in all levels of finances and social sectors. Those inhuman conditions have been imposed on the Iranian workers when they were denied of all their internationally recognized rights in the passed 30 years. Any strike, protest or attempt to organize has been faced with suppression, threats, unemployment and national security related charges. Despite the clear and present danger of suppression and unemployment, the Iranian workers filled the scenes with their protests against their backbreaking conditions. In hundreds of production and industrial centers centers, they organized many gatherings to show that they were not willing to continue to live in such inhuman living and working environments. We see some aspects of their protests in the passed month where many of the participants in the street movements consist of women, youth and their families. The 7th session of the United Nations’ rotational review of human rights is being held at the time when the president and vice president of the Syndicate of Workers of Tehran and Suburbs Vahed Ossalou and Madadi, hte Syndicate of Workers of Haft Tapeh Sugar Cane Company Ali Nejati and Alireza Saghafy along with many other labour activists are in jail and a teacher like Mr. Farzad Kamangar is sentenced to be hanged. Many participants of the May Day celebrations are still awaiting court decisions and many other syndicate members are in a limbo of being suspended from their works. We hope that demands of the Iranian workers of living honorable lives, away from any fear of suppression and threatening environment, will be considered in your session and is this issue is placed on the agenda of the 7th session of the United Nations’ rotational review of human rights. A new begining for green movement.Ahmadinejad's speeches are scape from truth & reality of the situation.Rregime can't tidy up the mess they are in. People in protest to regime of coup d'etat chant: Referendum , this is people's slogan ! 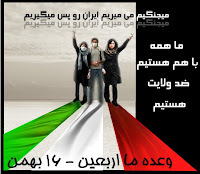 This is feb.11 the revolution day in Iran. 9 months of protest.This is a real problem for the regime.More people are joining the green movement. watch and see the anti-riot forces marching towards Azadi Square!!? ?By watching these video's can you call it celebration (of revolution day)? People in green movement took advantage of pro-regime rally and chanted their own songs and slogan in the treets from Ariashahr to Azadi Square . opposition to the regime of Ahmadinejad greet Karubi as he joins the protest on Feb. 11 in Tehran -Sadeghieh area. The website of "Kalemeh" : Mohammad Khatami the former reformist president for two terms has attended the protest today. According to report by the website of Kalemeh , former President mohammad khatami participated in todays protest against the regime of Ahmadinejad. He was in and around zanjan - Azadi intersection. 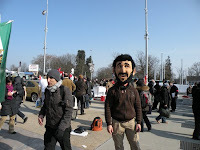 according to Parleman News , when people saw Mr. Khatami they greeted him and chanted slogan in his support. This caused anger among plain cloths Basiji's and security agents they started attacking Mr. Khatami and his car .At this point for preventing further clashes among protesters and basiji militias, Mr. Khatami decided to leave the scene. In another news by kalemeh web site, Mr. Khatami's brother Mohammad Reza Khatami a former parliamentarian and a leader of the Mosharekat party together with Ms. zahra Ashraghi and Ali Karubi the son of Mehdi Karubi one of the leader of the green movement were arrested. Despite weeks of preparation by regime to suppress the protest ,but green movement once again came out strong. Here people chant:"Death to khamenei"
"Jaras" a green movement online supporter reported that: There are clashes around the "Laleh" Park in Tehran .The anti-riot forces for identifying the protesters fires paint bullet and arresting them. Despite of several weeks of preparation by the regime to organize their forces and plans many options to suppress and control the opposition green movement , once again people came stronger but there are less option for people to report their protest via /internet, sms, or other means of communications. Mr. Musavi one of the leader of the opposition to the government of ahmadinejad was around the freedom square and as he was about to join the protesters he was sorrounded by the riot-guards and militia with batons and was unable to join the protesters. Mr. Karubi's who also joined the protest from Sadeghieh area in Tehran but was attacked in and around Ashrafi Isfahani street and his car glasses were shattered . The attackers were equipped with teargas and batons and paint bullets. Mr. karubi's son said : His father was able to escape and has returned home safely. Reports from Iran as it happens...Regime failed again to suppress the protest ... People continue to protest ..
People have captured and took control of the "Arya Shahr " area of Tehran. The helicopters of revolutionary Guards are flying from "Eshrat abad" barrack to different part of Tehran.Mobiles and telephones are cut off in and around "freedom Square" and "Arya Shahr" area .The gathering is huge, In Aryashahr the clashes are continue , it took only two minuites the people to come together.The whole Jenah Street is full of people , from morning to 12 pm more than 40 people were arrested only from this area. According to report Iranian are protesting in the major city's. In Tehran "Valiasr Square" clashes between the Basiji Militia and people are reported by eyewitness and the people at the entrance of Valiasre Bulevard burnt down a Basiji's motorcycle. The people are chanting : The government is doing crime and Khamenei is supporting them. A bus full of Basiji militia from Orumieh city in (Tehran -Arya Shahr area ) was set abalze. All the Bus Terminals are under severe security control.The security agents are controlling the coming and going out of the city. Ms. Zahra Rahnavard the wife of Mir Hossain Musavi the winner of last June presidential election participated in the protest today in Sadeghieh of Tehran. She was beaten and hurt by the plain cloths militia but people have made a chain and protected her and she was able to leave the area. In the city of Isfahan people came out stronger than before, one report says.On the bridge known as "Siosepol" people clashed with Basiji's and were teargased and were pepper sprayed. the people were chanting: death to dictator . Basiji militia throwing stone on people and the green call not to do the same ...The green movement stronger than ever...Look at it again ..
A few days ago people from the city of "Lar" protested against the regime of coup detat. the night befor Feb. 11- People are chanting "Alah o akbar"
All Out - Tomorrow Feb 11 ,2010 nationwide protest against the regime of coup d'etat. Tonight , one night before Feb.11 , the night before (1978-79) revolution day, the chant of death to dictator around "Sadeghieh" in Tehran shakes the heart of any passer-by. The regime that claims: 85% of Iranian has voted yes for the regime, is afraid of internet/emails. Tomorrow is the game of "league of nation" against the regime of coup d,etat.Have you prepared your green symbol? In the northern part of the city of Tehran ,the line for buying Gas for the car reach to kilometers.. In many part of the city of Tehran between 8:00pm and 9:00pm people were chanting "Alah o Akbar"on their rooftops . Regime has closed the enterance of the streets to "Freedom Square" and they have closed also the streets to all major Squares particularly the 'Revolution Square". The regime has prepared a huge stage in "Freedom square" for speech. Along the streest from freedom square to revolution square ,they have built booth's which seems is for Basiji militia of different citys or region. They have also hanged huge banners with picture of Khamenei and Khomeini along the streets. They have tried not to mention or write the Basij Melitia and their region on the booths , to show they are ordinary people and not Basiji.This goes all the way to "Ferdousi Square" . the regime is focusing on Freedom Square and perhaps is trying hard to bring its militias with plain cloths to Freedom square. Right now that i'm writing this line the security agents are busy at night arresting the activists or anyone whome they suspect may protest against them. The weather forecat reported that the northern part of the country, along Caspian Sea will be raining for the coming days and this is bad for the regime , because people of Tehran won't leave Tehran and will stay and will come to the streets. The Revolutionary Guards and seyed Ali Khamenei have prepared a military plan for tomorrow and all revolutionary Guards , Basij Militia ,police force, security forces, personnel of Ministry of Information and .... are on alert. Also in a statement many members and sympatizers of " Fergheh democrat" party also announced of joining the green movement in Feb. 11 protest against the regime of coup d'etat. In the statement they have said: For democratization of Iran , we will join with other free willing Iranian particularly the Iranian Azari's. Tomorrow night is the night that Iranian people won't sleep and the patriotic feeling will fill their blood and everyone will join their brother and sister, parents and grand parents , freinds hand in hand for their human rights and freedom in Iran. Instead the coup d'etat officials is frightened and showing the signe of panic attack and nightmare. How many can you arrest? Regime is in deep trouble. The more they arrest , the more they get themselves into trouble. Infact, there is no way out ,until the regime is out , It seems this is the only choice. The number of Journalists arrested in Iran has reached to 56 person ! The number of journalists arrested in Iran has reached to 55 and the latest journalist arrested in Hassan Zahouri the technical reporter of cultural heritage . This journalist sufferes from heart problem and his family members are worried about his health condition in the prison. In the last two days except Hassan zahouri , Ahmad jalali Farahani, Ehsan Mehrabi, Mahsa Jazini, Akbar Montajebi, somayeh momeni, Zeynab Kazemkhah and Ali Kalaei all journalist were arrested. yesterday Mr. amir Sadeghi photojournalist was arrested in his workplace.according to the website of "Jaras", the security forces attended in Mr. Sadeghi's workplace , the "Farhang Ashti"
newspaper and arrested him. Mr. amir Sadeghi was charged with taking photo's from the protest day of "Ashura " . Despite of threat and the danger of being arrested by regime , people continue to write slogan in protest on new bills ! February 11 worldwide solidarity with green movement in Iran! In creation of the essence and soul. One of the major Persian poets of the medieval period. He is recognized not only for the quality of his writing, but also for the depth of his social thoughts. (1184 – 1283/1291?). 1-Once again to Islamic countries/nations and Moslem people around the world. I have no doubt that you have heard disturbing news from Iran through international media /TV and journalists specially in the last 8 months.You have heard that the regime of Ahmadinejad in Iran cheated the presidential election in last June 12 and the guardian council falsely have called Ahmadinejad as the winner over Mr. Musavi. In the first Friday prayer after June 12 Khamenei the leader of the Islamic Republic also came in approving and supporting Ahmadinejad . On June 13, millions of your Iranian moslem brother and sister and people with other faith poured into the street and protested against the cheating. On that day the regime of coup d'etat oppened fire on protesters and as a result many of your moslem brother and sister were killed . According to news close to 80 people were killed. ( you can watch all the video's in IRAN WATCH CANADA and you judge yourself) and thousands were arrested , detained , tortured or brutally murdered and many of them secretly buried without the presence of the victims family and proper burial.The protest is going on for more than eight months now. The moslem nation of Malaysia, Indonesia, Philippines, Lebanon, Bahrain, Kuwait, Chechniya,Bosnia , palestine, Iraq, Afghanistan ,Pakistan ,Bangladesh,Yemen, Sumaliya, Sudan, China, Azarbayejan, Uzbakistan, Tajikistan must reject the financial support of Ahmadinejad's. Getting money from the hands of Ahmadinejad and Khameneei who orders to kill your moslem brothers and sisters is not Halal. On this February 11 watch the news and support your Moslem brother and sister in Iran and condemn the savegery and brutality of the ahmadinejad-Khamenei regime of coup d'etat in Iran. Iranian people needs your help and watch you that how you react to the suppression . Dont support the regime of Ahmadinejad blindly. Moslem brother and sister around the world you must not ignore your moral and responsibility as moslem. 2-People of China and Russia must put pressure on their government not to support the regime of Ahmadinejad in Iran technically/ logistically and in UN when deciding on the issue of human rights. The Government of China and Russia will pay dearly in future for their support of Ahmadinejad -Khamenei against Iranian free willing people. 3- People of Latin America specially Bulivia, Venezuela, Cuba , Nicaragua , Brazil and other countries that the regime of Ahmadinejad is trying to make tie must put pressure on their regime not to support the regime of Ahmadinejad. Iranian people are making history. They created a unique movement known as green movement for human rights and change in Iran. This movement is a civil rights movement. A peaceful and non violent movement and it needs your support. Shirin Ebadi: The situation in Iran is like a barrel of dynamite, small things may explode this barrel ! The Regime had chance to reverse the situation it created. Now seems there is less chance and the regime has decided to use force and create fear among the society but everyone knows that; first of all it is the regime officials who day and night think that people may at any time by the millions pour into the streets and attack to their high commands post . By the way, if tonight like the election result announcement night, people not to sleep and pour into the street next morning , what the regime official can do? People don't usually inform when they will outpour into the street. It may happen all of a sudden and in a surprise move. Iran looks like the sea -calmness before the storm. Regime has began a madly/frantic game. They shut down SMS . They disrupt internet. they are trying to hack the major websites . they have also created blackout and cause problems for satelite dishes. They executed political prisoners to create fear. They have started a wave of arrest of students and political or human rights activists from all over Iran. Why the regime is doing this ? This will create a situation like the day after they have announceed Ahmadinejad is the winner. That night the people couldn't sleep and the next day by the millions they outpoured into the street. 70 percent of Iranian are young rational with fresh and hot blood. Regime is creating a situation that the blood will boil in the young bodies. a dangerous game indeed. news that are coming shows that; how much the regime has become affraid of the coming of February 11 ( the revolution Day ) which is set by the people as a national day of protest against the regime of coup d'etat. According to news; the regime has gathered all its militia forces in Tehran and major city's. The coup d'etat head quarter is busy in their offices planning how to suppress the green movement. Despite of all the effort and as a historical fact, Green movement will survive and regime seems digging its grave by its own hands! According to another news; the people of the city of Lar (Larestan) has revoulted against the regime city headquarters and several days of clashes between people and regime forces were reported. The city is an example of the situation that is going on in all the city's in Iran. What the regime can do? To suppress more and kill more? arrest and detain more than they have now? News says ; the political prisoners are by the thousands! The regime admit 4000 have been arrested!?? the political game the regime play belong to a century ago. We live in a new era of information technology and global village . Most of the young Iranian are familiar with this policy .The regime trys to set games such as launching Satellite and promissing to give free money to low income people or free potato . Some people may take it but the next day they join the protest against the regime . 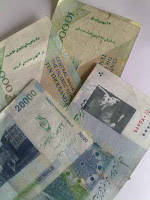 News indicate of the financial crisis in the coming Persian new year (March 20th ).The price of the basic daily food commodities such as bread and meat and gas are going to increase. Inflation will become unimaginable in the coming Persian new year.Unemployment is on the rise.This will bring more potential people into the green movement. Protests and strikes are growing among Iranian workers. What the regime can do? One thing the regime can do and that is to listen to the people and fulfill their demands or sleep tonight and everynight with a nightmare of the next day .The situation in Iran is like a barrel of dynamite and a small thing may explode the barrel, well said by Shirin Ebadi. Washington Post journalist in Evin prison ! CPJ: Iran with 47 journalists in jail set new records ! Iranian authorities are now holding at least 47 journalists in prison, more than any single country has imprisoned since 1996, according to a new survey by the Committee to Protect Journalists. While many of the detainees were arrested in the aftermath of the disputed June presidential election, CPJ's survey found that authorities are continuing to wage an aggressive campaign to round up independent and opposition journalists. At least 26 journalists have been jailed in the last two months alone, CPJ found. Iranian & German blockade the consulate of the Islamic Republic in Frankfurt-Germany for two hours in solidarity with the people of Iran! A poster released by protesters says:On Feb.5 - 40 days after the killing (the martyrs) all together from Imam Hossain Square to Freedom Square! Outside Iran -Regime has lost credibility in abroad . Green Iranian outside Iran in support of their brother and sister inside Iran continue their protest in front of the regime embassies around the world. Inside Iran-Once again the people ,friend and family members of the political prisoners have gathered in front of the Evin prison and chanted for the release of their loved one. Last night people continued to chant: Alah O Akbar , on their rooftops. According to news, regime tried to disrupt the internet services of few citys. We witness today the resistance of people against corruption, lies and fraud . Dictatorship and despotism is still alive in Iran. Today the prison is full of the best childeren of the nation while the plunderer of the national wealth and real perverts are free and do whatever they want . We have all come out for reform not for revenge or taking power.The green movement won't stop its peaceful and moralistic struggle of their human rights. Shirin Ebadi Iranian Noble Peace Prize Winner:Let's avoid violence and not to get into the trap of those who push for violence! Ms. shirin Ebadi the Noble Peace Prize winner and the head of the "Association of Human Rights Defenders in Iran" in a message to Iranian people said: All of us Iranian have heavy responsibility. Let's all of us together make oath that everyone in his or her position with whatever role we play will take steps towards non violence and peaceful action. we are a peaceful nation and now we must keep up our opposition,critical views and protest in a civil manners and avoid all kinds of violence completely and not to get into the trap of those who pushes for violence. She protested to the oppressions and use of violence against the peaceful protesters since post election by the government. She asked the government officials to reform their past and present policies and have compliance with the demands of the people and she said : those are your legal duties. And your first duty is to stop violence against the people. If you continue the use of violence you will be held responsible by the Iranian people and the whole world. Stop execution of freedom willing Iranian !